Who doesn’t like a great appetizer? Especially when ordinary gets kicked up about a hundred times like this shrimp cocktail with pickled daikon radish. It’s an unusual combination sure to excite your taste buds. 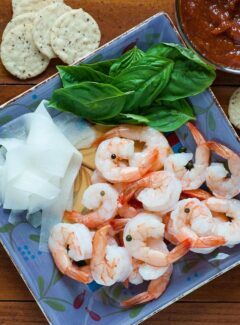 Eat this shrimp cocktail by wrapping the shrimp with a little fresh basil, then a wrap of the pickled daikon and finally dipped into the homemade cocktail sauce. It really tastes fantastic. Who’d have thought basil and radish with shrimp and cocktail sauce would be good? You’ve got to try it to believe it. 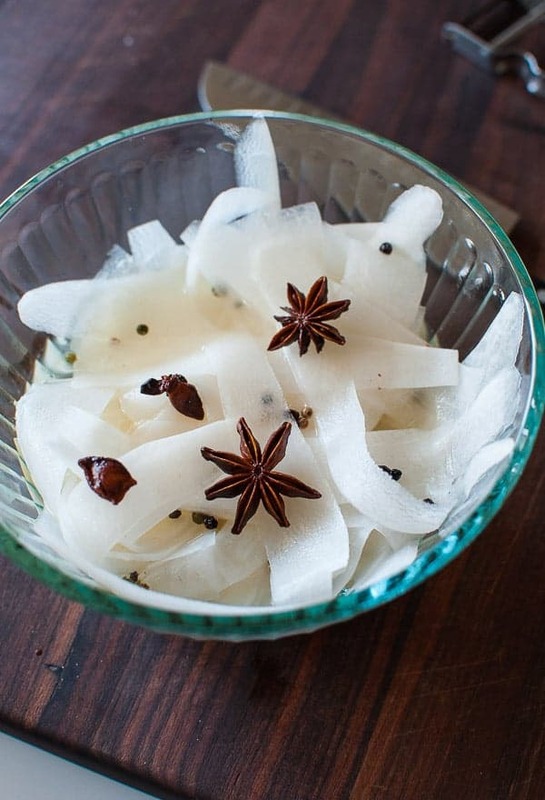 To be honest with you, I’d never heard of daikon radish before until I found this recipe from Bryan and Michael Voltaggio. And more surprisingly, our local Publix grocery had them. And not just a couple, but a whole pile of them ranging in size from big to gigantic. The one I purchased was just under one pound and it was the smallest one there. The radish looks like a white carrot but tastes like a fine textured, mild radish. Very tasty. I used a vegetable peeler to remove the outer skin, then used the peeler to make ribbons from the radish. A mandoline could also be used. The pickling liquid is brought to a simmer, then poured over the peeled daikon. Let it cool slightly, then cover tightly and refrigerate for at least a couple hours. The shrimp picture here are sized 30 to 35 per pound, shell on but cut and deveined. Larger shrimp like size 16 to 20 per pound would be lovely, but the price is more than double what the 30 to 35 cost. Get what you can afford for the occasion. Poaching the shrimp works out great for the shrimp cocktail. 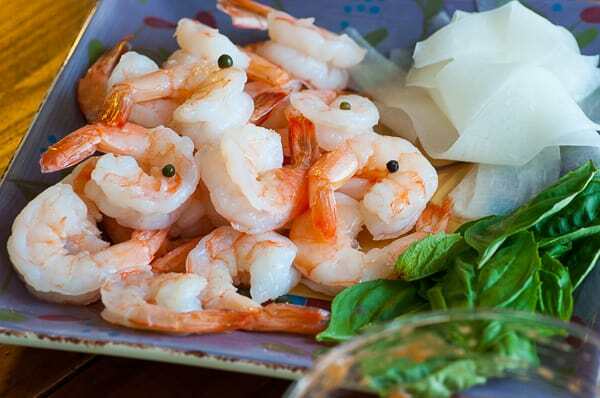 Using shell on shrimp also adds a little more flavor to the shrimp even though it is a little more work to peel. 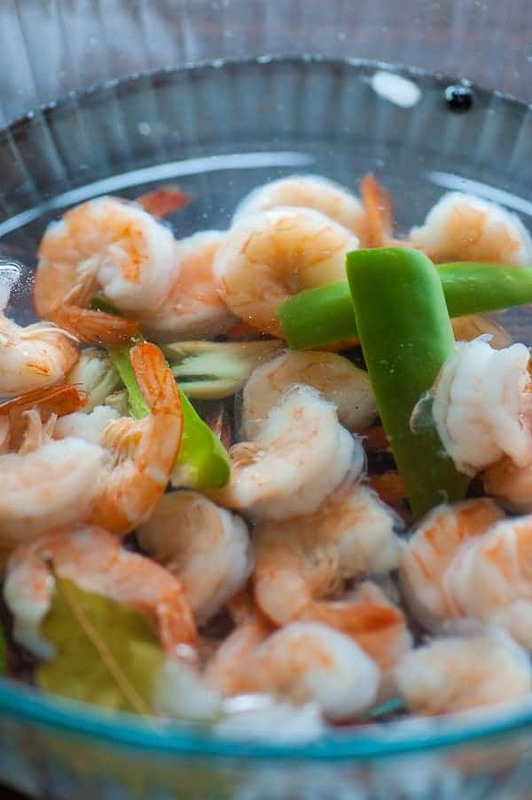 Drop the poached shrimp into an ice bath to cool, peel, then refrigerate until eaten. The cocktail sauce from the Voltaggio brothers uses a green banana to add a little sweetness and thickening to the sauce. I made it as described but when I put the sauce in a blender to puree, it really didn’t work that well. The sauce got too thick to be blended well. Perhaps using my small Kitchen Aid food processor would have been better. I made a second batch of the sauce, without the banana and it tasted great…and no blender needed to be used. So in the recipe ingredients I’ll keep the green banana in there. The sauce with the banana was definitely sweeter and the sweetness took some of the bite out of the horseradish. I’ll leave it up to you if you want to puree the sauce. Shrimp cocktail with pickled daikon radish is amazingly good, especially when combined with the basil and homemade sauce. MaryJo and I devoured it in short order. Disclaimer: This recipe post contains an affiliate link which means that Joe’s Healthy Meals will earn a commission if you purchase anything from this link. Thanks! Very tasty light appetizer with tangy pickled daikon radish. Author Joe, from Bryan and Michael Voltaggio in Food and Wine Mag. Pour the brine over the daikon, let cool slightly, then cover and refrigerate at least two hours. If you used the banana, place in a blender or small food processor and puree. Put 4 to 6 cups of water into a large sauce pan and add the spices and bring to a boil. Remove with a strainer and place into the ice water bath until cool. The prep time for this includes active and passive times and is an estimate. Wow! That is adventurous! ? LOVE this! 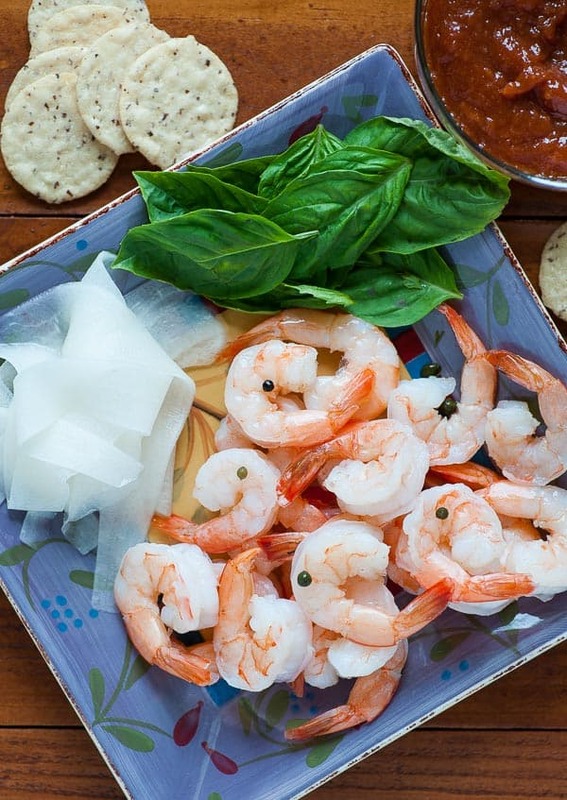 It’s a unique, delicious, and fun way to eat shrimp.